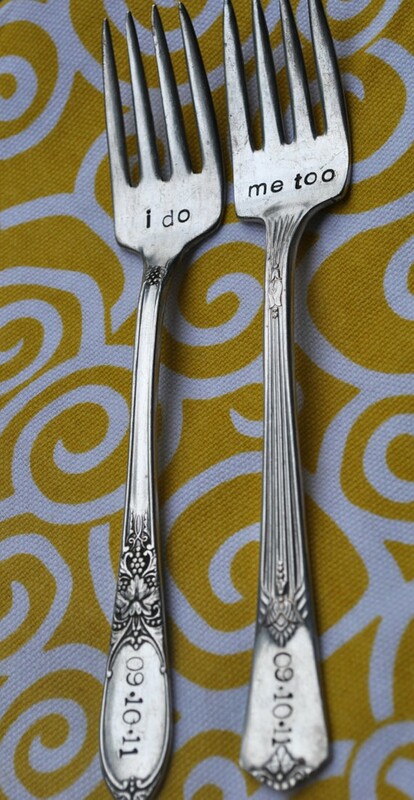 Inexpensive wedding souvenirs doesn’t mean that they have to look cheap. 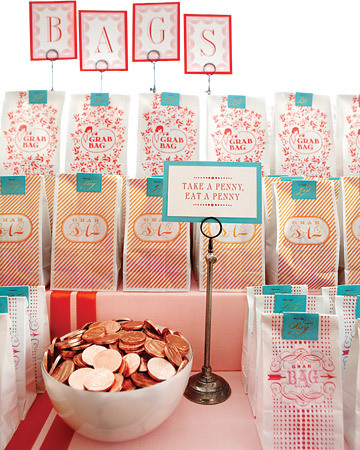 With these great ideas, no one will know how little you paid for each favor. Most can be found or made for under $10. Go visit wholesale stores, or online websites and get some good ideas too. You’ll be surprised with you find there! Tie some Hershey’s Kisses or Ferrero Rocher Chocolates in silver or gold netting or in your color motif and finish with a pretty ribbon. Wholesale stores will have cellophane and netting along with an array of inexpensive ribbon. Another idea is buying simple shot glasses or mini take-out boxes and fill them with candy. You can find nice magnets at stores that go along with your theme. 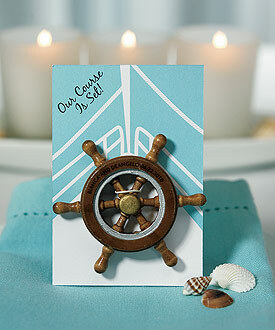 For a beach wedding, you might have a starfish or sail boat. For a wedding during the holidays, you might have a snowman. Once you find the magnet you like, cover it with netting or plastic with a thank you card or tie a ribbon around it as is. Soaps are a really nice item to offer as a favor. Many pressed soaps are so lovely that they look much more expensive than they are. Find them in a shape and design that matches your theme. 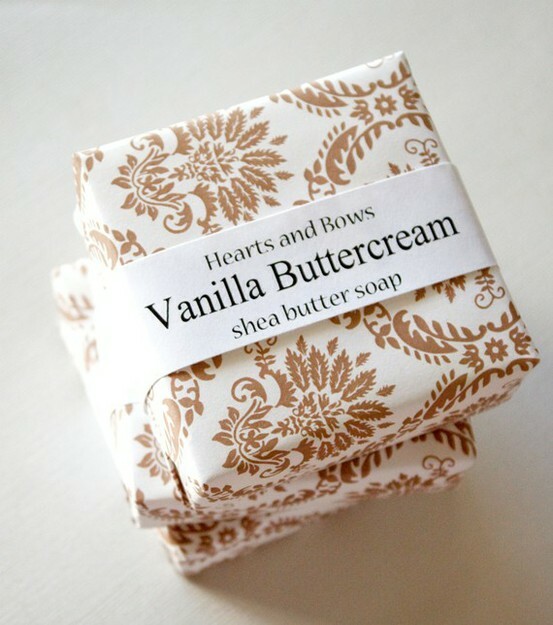 Or, if you really want to get crafty and save money, make your own soap wedding favors. You can find soap-making supplies at some specialty stores. They have unique molds that will allow you to hand pour your soaps. Check out this wrapping tutorial of Paper Wrapped Soaps if you're planning to make your own soaps. Candles have been a popular gift to guests for many years. They may be of any size, shape, designs or scent. 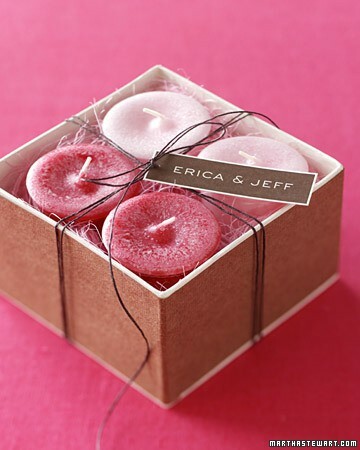 Many couples use votive candles and have them in decorative holders. There are also specialty candles such a wedding cake-shaped candles or tradition inspired candles. Nothing says romance like candlelight. You can do a lot with photos. You can personalize mugs, mouse pads, pens, cards or stationery and other personal items (keychains, money clips, clocks, etc.) They can be personalized with the couple's names and usually the event date as well. This gives guests a nice item that is a distinct reminder of the event. Many couples give picture frames as gifts. These frames may be placed in goodie bags. These frames are generally no larger than 4x6, but some couples opt for larger frames. You can also have your guests walk away with a CD of all your wedding songs. 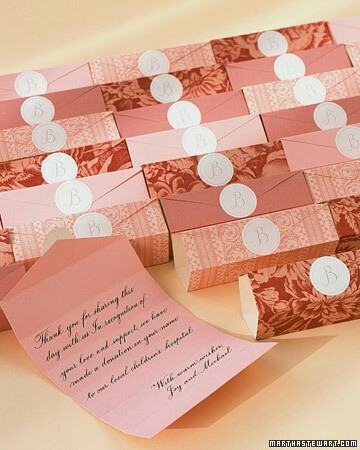 Instead of including wedding souvenirs that will be forgotten a few minutes after the wedding, some couples look to do good and donate the money they would have spent on them to a charity of their choosing. 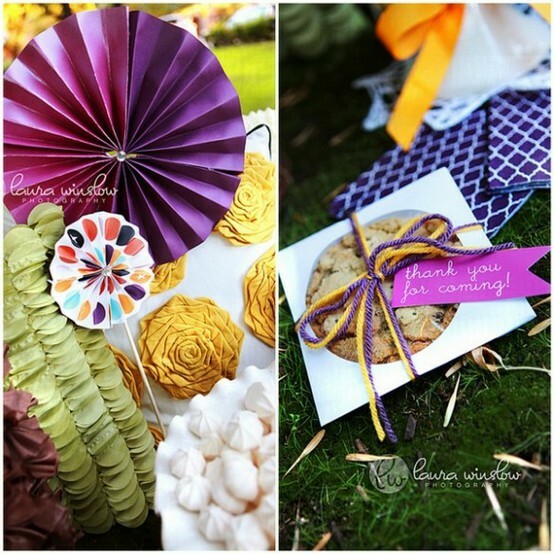 It will cost you less to do a donation than to buy batches of wedding gifts for guests, ribbon, labels, etc. So do it your way and donate. No one will even miss that little souvenir and they’ll be glad they could be invited with a good cause.